Our newly renovated (for winter 2018) ski-to-door chalet Haut-Forts, with outdoor hot tub, is in a beautiful location in the Prodains vallée area of Morzine. The Prodains telecabine, giving you direct access to the vast ski areas of Avoriaz and the Portes Du Soleil, is five minutes away on foot. Several restaurants and bars are within a few minutes walk and the local bakery will even deliver daily fresh bread & croissants to the front door! It is located right next to our other chalet Les Forclettes (which also has an outdoor hot tub) and is similar in terms of size, layout and design. This newly renovated, (ready for winter 2017/18), charming chalet offers a spacious open plan lounge-diner with a large corner sofa, an Ultra HD Smart TV with Netflix, a Blu-Ray DVD player and a Bluetooth speaker dock to keep you entertained. It opens out onto a large terrace/garden that features an outdoor hot tub and amazing panoramic views of the surrounding mountains. There is also a second lounge/chill-out area (which is a cabin room) and is equipped with a flat screen TV/Blu-Ray player and an Xbox One. The fully equipped kitchen has a fridge/freezer, oven, XL 4-ring induction hob, microwave, Nespresso machine, dish washer and dining table seating up to ten. The chalet has three en-suite bedrooms, all of which have balconies. Bedroom one is a double room with either two single beds or one double. Bedroom two is a triple room and can be configured as a twin or double room or a triple with either three single beds or a double and single bed. Bedroom three is a family/quad room with mezzanine and can be configured as either four single beds or one double and two single beds. The second lounge/chill-out area can double up as a fourth bedroom (with it's own en-suite bathroom) that sleeps two. Regular free resort buses pass just outside the chalet every ten minutes to take you to and from Morzine resort centre (which is a five minute ride away). 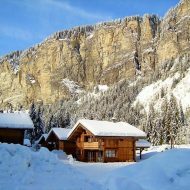 Chalet Haut-Forts operates on a Sunday to Sunday basis during the winter season and our prices include quality bed linen and towels, end of stay cleaning and in-resort tourist tax. The price is for the whole chalet for the period stated. Upon arrival at the chalet you will find the following included free of charge: tea, coffee, sugar, milk, dishwasher tablets, washing liquid, sponge, bin bags, cling film, tin foil, kitchen roll, toilet roll, hand soap, washing powder (for clothes), tea towels and a hairdryer in each bathroom. One box of complimentary firewood is also provided. Double bedrooms can be configured as either two single beds or one double bed. Triple rooms can be either three single beds or one double bed and one single bed. Family/quad rooms can be configured as either four single beds or one double and two single beds. Mid stay cleaning can be arranged for €120 Euros. Chalet Haut-Forts operates on a Sunday to Sunday basis during the summer season and our prices include quality bed linen and towels, end of stay cleaning and in-resort tourist tax. The price is for the whole chalet for the period stated.